The Rockport Film Review: The 2010 French Thriller "Love Crime"
A brilliantly acted modern French thriller is one way of describing director Alain Corneau's latest film "Love Crime (Crime D'amour)". 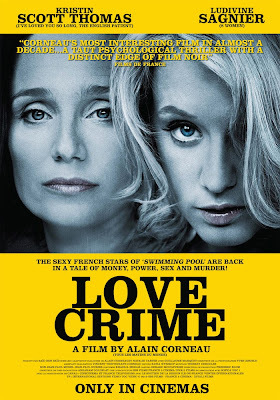 Starring Kristin Scott Thomas and Ludivine Sagnier as executive and assistant at a big corporate conglomerate. Scott Thomas plays the brutally ruthless and manipulative Christine, while Sagnier is Isabelle the young and beautiful assistant. (aka fresh meat). Christine has Isabelle take her place on a business trip to Cairo along with the attractive Phillipe. Before long they're having torrid affair, but when Phillipe breaks it off and Christine takes credit for all of Isabelle's work, the cat and mouse game of revenge begins. The story and plot are heavily structured and things have to happen as it's written to make everything else happen. I'm not all that familiar with the French legal system, but there are a few instances when something has to happen for the story to move forward and it doesn't matter how improbable it seems. When Christine publicly humiliates Isabelle in front of all of the executives at a party, this is the last straw and Isabelle plans an executes an even more brutal plan. After another get together at Christine's house, Isabelle dressed in a white overall stabs her to death but leaves clues to implicate herself. At first viewing, this seems kind of odd but it's all apart of her elaborate plan. The evidence is seemingly overwhelming and Isabelle is sent to prison. With the help of her sister and friendly co-worker Daniel, Isabelle puts the other half of her plan into motion. The acting by these two women really pushes this film to more than just your average thriller. To put it in Hollywood terms its "The Devil Wears Prada" meets "The Perfect Murder". Eventually, everything happens as it should and her masterful plan is complete. The road up the corporate latter is pretty brutal and leaves its share of victims along the way both literally and figuratively. Whoever wants it more and is willing to sell out their very soul will become richer and that more powerful. "Love Crime" is currently available on Netflix watch instantly.